Andis Master is an iconic Andis hair clipper. It’s the poster boy for the company’s product portfolio, and deservedly so. It makes sense then to provide professional clipper fans with a luxurious, exquisite version of the traditional Master hair cutter. Lo and behold: this is Andis Black Master limited edition. To say it looks amazing would be an understatement. Every barber shop, every home possessing these will scream “style” to anyone visiting. However, is Andis Master Black label worth its rather substantial price? What are the differences between the 01705 Black Master and the original Andis Master professional clipper? Time to find out. In the veins of Master traditions, the Andis Black Master clipper features an extra tough aluminium housing. It’s these polished, durable looks that made the product so famous among barbers. The Black Master, however, goes even further. The aluminium body here is powder-coated with a matte black finish. Sure enough, this detailed work makes it twice the more stylish and gorgeous. It’s not only cosmetics, though. The coating further protects your Andis Master Black label clipper from any chipping or rust. Additionally, the black finish makes the hair cutter’s body more textured. You’ll have an even better grip – and the original Master clipper was already doing good in this regard. The other nice aspect is that it won’t end up with fingerprints all over it. 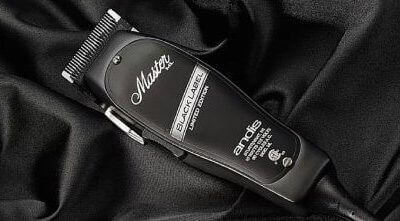 Looking at the Andis Black Master clipper’s motor and blades, it’s not much different than the traditional Master’s. You have the trademark Andis magnetic motor operating on 14,000 cutting strokes per minute. The motor is ready for heavy-duty and won’t stumble even after several consecutive haircuts. Cosmetically, the Andis Black blades are different – black-on-black finish powered by Andis’ own Electro-Glide Technology. Elegant and stylish, the black blades really distinguish themselves from your usual steel blades. At the same time, though, they’re just like the Master’s in terms of operation. Same high quality and sharpness. Same option to adjust them from size #000 to #1 through the lever on the Black Master clipper’s side. The blade teeth are flat and will look hungry to cut some hair. Not much to say here – your usual Andis clipper blade quality, this time coated in stylish black. Cuts are crisp, close and very precise. An even better hair clipper for fades? The original Andis Master electric hair clipper is a fantastic choice if you want to do some fades. 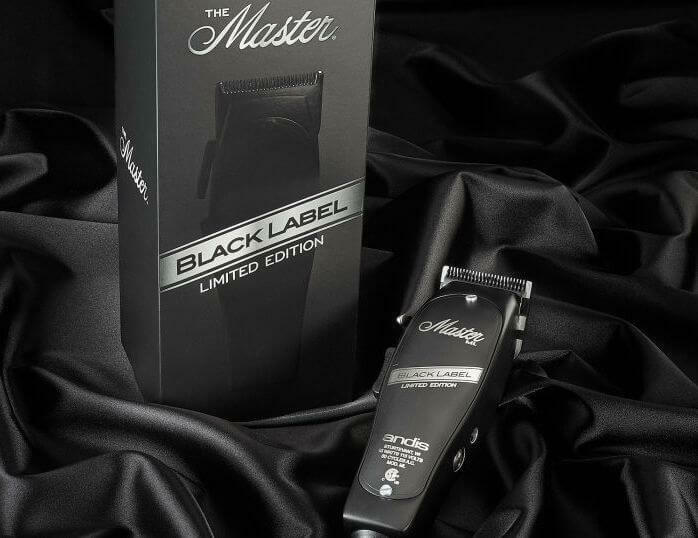 It will be of no surprise to you that the Black Master clipper maintains the status quo. However, there’s a slight improvement here. I’ve said before, but the original has some serious heating issues with longer haircuts. And proper fading can take quite some time. As a result, the Master’s warms a little bit too much and might be uncomfortable in your hands. In my opinion, Andis Black’s powdered coating makes a difference. It isolates some of the accumulated heat so it stays a bit cooler in your palm. So while the motor and blades are not different, this little difference might make it a better hair clipper for fades. The heat transfer to the blade still applies, however. The blade can get quite hot if you run the clippers for too long at a time. If you use these as your primary clippers, keep that in mind. Another great Andis fading clipper choice would be the brand new Pro Alloy XTR clipper pictured below. Andis takes the best of the Master and improves upon it. Some of the negatives, especially hot hot it gets, are dealt with when it comes to the Pro Alloy. It is much more solid, stays cooler and is not nearly as noisy as the Master. If I had to choose between the two for a primary clipper, I would go for the Pro Alloy. You can read our review on it here. Andis have gone above and beyond in pampering anyone who decides to fetch the Black Master hair clipper. Limited edition gift box aside, the hair cutter arrives in a wonderful drawstring bag made of black velvet. Compared with how usual clippers get packaged, this is the ultimate way to tickle your fancy when it comes to accessories. The Andis Black stays true to the original Master quality and improves on it with premium looks. You can’t deny its beauty – you won’t see a clipper more exquisite than it. Bonus points if you go ahead and pair it with the GTX T-Outliner trimmer from Amazon.com. If you’re starting out or just not a dedicated Andis fan, though, it doesn’t make much sense to spend so much money. The original Master’s will do the job well enough on a cheaper price. There’s just not that much of a difference from a functional viewpoint. Looks aren’t everything, but they do count. This is especially true if you are a new barber. If you look like you’re using the same kit from school, then you may not be taken seriously. If your gear looks stylish, it may translate to some people that you know what you are doing. If it helps you pull down and extra client per day then these clippers will pay for themselves in a very short time. And you look pretty cool in the process! For any appreciator of Andis brand, though, this one is a must. You don’t know when it will get depleted. You won’t see anything Andis be even remotely that exquisite (well, at least at the time of me writing this post). Andis Master Black label limited edition is the holy grail for clipper connoisseurs. You just can’t skip on it. When it comes to Andis, you pretty much know what you are getting. I personally am an Oster guy, but I do love the look of Andis clippers over Oster every day of the week. These clippers really up the style game of any barber. Do you have questions about these clippers or want to know how they compare to some other brands? Leave a comment in the box below and we will get back to you! We’re here to help and love receiving questions and comments. Make Your Own Cold Pressed Castor Oil Hair Mask for Hair Growth! Do you know if the Blackout trimmer is a GTX Outliner? Just wrote Ryan as he did the review to ask him, because he’s out of town for a few days. Yes, the Blackout is essentially the GTO model (T-Outliner.) The only difference is again the coating and more stylish design. Otherwise, performance-wise, it should be exactly the same. Some people confuse it with the GTX: don’t be misled. The Blackout doesn’t have the “deep tooth” blade of the GTX, just a standard T-Outliner one. Thanks for the quick response… In your opinion, is the GTX is still better than the Blackout then? Honestly, the Blackout for me is a way to make you feel fancy and get that ‘limited’ luxurious feel. In terms of functionality…it’s just a regular GTO. Both me and Ryan are bigger fans of the GTX as the deep tooth blade goes better through thicker hair. So, if you don’t have especially thick hair and want to feel fancy, the Blackout is a great way to pamper yourself a bit. If you want more utility, my personal opinion is that a GTX is better. Thanks so much Alex and Ryan!